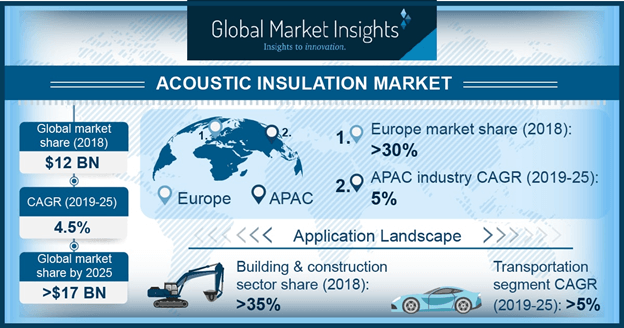 Acoustic Insulation Market size is estimated to surpass USD 17 billion by 2025; according to a new research report by Global Market Insights, Inc. Surging concerns for employee comfort levels owing to a demand rise for noise-free environments in the commercial buildings will provide a positive scope for industry expansion. Rapid industrialization & increasing construction spending in the developing economies such as Malaysia, India, Mexico, Saudi Arabia, UAE, and Brazil will further support the industry expansion. Factors such as stringent building codes, recovery in building & construction expenditure, and the requirement for energy efficient buildings with sound dampening will augment the acoustic insulation demand up to 2025.